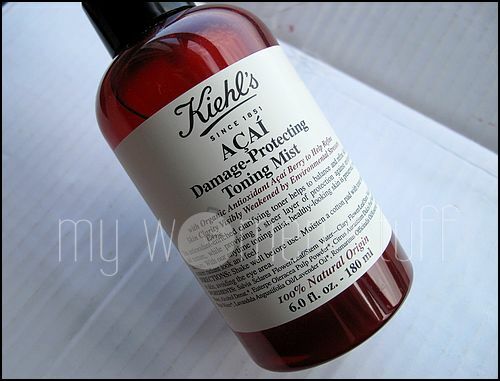 The Kiehl’s Acai Damage Protecting Toning Mist comes with a spray nozzle so you can spritz the toner on your skin. I found the instructions on the label strange. They tell you to spray the toner on a piece of cotton pad and then wipe on your face avoiding your eye area. Usually, mists can be spritzed directly on the skin and that is what I was told at the store when I purchased this. I decided for once not to follow instructions on the label, and use it as a mist. What I do is, after cleansing my face, I’d spritz on the misting toner and pat it in before applying moisturizer. I will advise you to keep your eyes closed though – it can sting a little if it gets in your eyes. The mist cools down my skin a treat and it smells great – of lavender and a slight tangy citrus. I found that when I was hot and bothered, spraying some of the mist on my skin helps calm and cool it down faster than thermal water does. Also, its a little too expensive to keep spritzing for fun and I did not find it very moisturizing. A 180ml bottle retails for RM120 at Kiehl’s stores. It does last a long while though. I’d estimate that with daily use twice a day, a bottle could last you up to 2.5-3 months so it isn’t all THAT expensive depending on how you look at it. I spoke to someone who told me that using the Kiehl’s Acai Berry Toning Mist had helped her sensitive irritated skin from eczema, especially when there were dry patches. She said it helped soothe the itch and help with the dry bits of skin. Not having dry patches on my skin, I couldn’t quite carry out this experiment. If you do have sensitive or irritated skin and found that this misting toner works, do share with us yeah? PREVIOUS POST: MWS Cafe Open Day #2 – let’s chat! I was told it worked especially on dry patches to soothe it. I can’t tell coz I don’t have this problem. i will be sure to feedback to a friend who works at Kiehls on the size. excellent point! like yourself, i love the product too. im gonna buy the lancome primeodiale which works a dream for me..but SIGH what a WASTE of RM 180!!!! i wanan cry! !